As our bus turned right—east—onto Page Avenue, a major thoroughfare, we saw single-and multi-family homes alongside boarded up ones. Something (unexpected to some) adorned the latter: murals upon murals upon murals full of images of famous black St. Louisians. There was one of Jamala Rogers, activist, author, and columnist for the St. Louis American (black-owned weekly newspaper), and another of J.B. “Jet” Banks, former Missouri State Senator, who served for three decades. 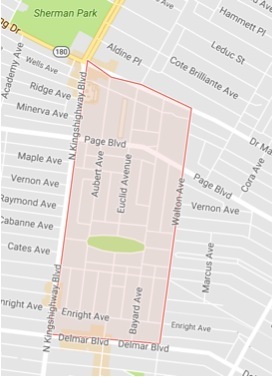 From our post on Euclid Avenue our charge was simple: walk south until Maryland Avenue, some two miles away. The only other directions: be mindful and observe. These observations formed the assignment due days later: jottings with initial impressions and composed fieldnotes about the experience of walking along Euclid Ave. This assignment was part of “Urban Ethnography in St. Louis,” a course I am teaching this semester at Washington University in St. Louis. My charge: train students in ethnographic field methods and the important work of observation, field research, interviewing, and documentation; and teach genealogies of urban ethnography especially related to Anthropology and Sociology as well as to American Studies, Performance Studies, and Urban Studies. Do this all situated within St. Louis with particular attention to how spatial racism, segregation, poverty, processes of displacement, gentrification, neoliberalism, and cultural and expressive practices have shaped culture in the city. 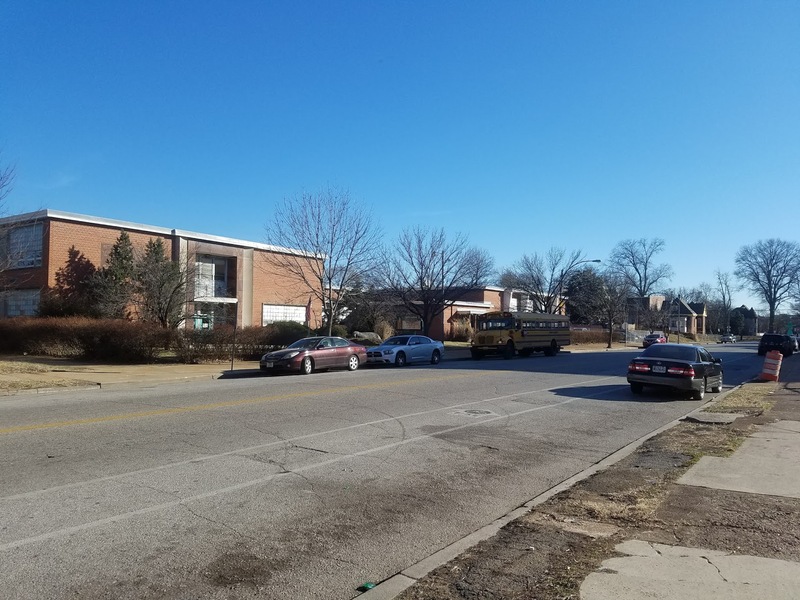 The walk south on Euclid Ave. would bring students from and through majority black St. Louis neighborhoods to a majority white St. Louis neighborhood. On the first part of our walk, students observed buildings and businesses including Salvation Army, Dollar General, and Family Dollar. Much was much boarded-up like Euclid School, a former public school now for sale by the city, farther along our walk. One student observed a run-down brick house with a beautiful structure that he assumed could be easily, if not inexpensively, rehabbed. As he got closer to it, he heard the sound of what seemed like 100 birds chirping inside of it. But much was also inhabited and cared for, like lawns where residents lived or immaculately cared for churches. They observed streets and sidewalks, often full of litter. Many spoke about the tactile feeling of walking on the uneven sidewalks made more so by shards of broken glass and an array of litter—some which moved slowly in the wind—of different sizes and weights. One student named the objects she saw on sidewalks and grass—empty soda cans and fast food wrappers—as indicating someone’s past consumption. They observed the people: initially mostly black. Residents entering or leaving homes; children whizzing by on schools buses; the rare passerby who would sometimes say hello; the group of black men elevated on ladders, moving bricks from a boarded up home onto a pallet; the one white woman, who many students ascribed a role other than resident, talking with a black man on his porch. They observed sounds of school children bantering, men talking, cars driving by and blasting music, birds chirping, the gentle wind. After the fieldtrip, I explained where we had walked. 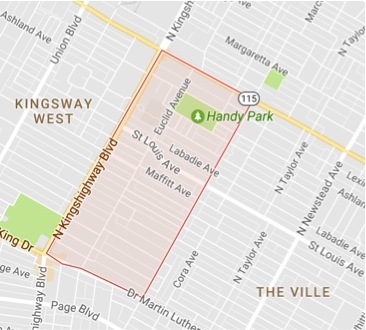 We started in Kingsway East, a North St. Louis City neighborhood bounded by Kingshighway, Natural Bridge, Marcus Avenue, and Dr. Martin Luther King Drive. 4,322 residents of Kingsway East were counted in 2000. That is a 14% decline from the 1990 census count. It’s 98% black. There were 2,162 housing units, 80% of which were occupied, 52% renters, 48% owners. The 2000 census counted 14,144 residents (4% decline from 1990s count) of whom 56% were white, 36% black, 5% Asian and 2% Hispanic/Latino. 9,572 housing units were 89% occupied, 26% by owners and 74% by renters. The Central West End was one of a handful of central corridor neighborhoods that actually gained residents in the 2010 Census count (2% increase). Racial counts from the 2010 Census yielded 58% white, 28% black, 11% Asian and 3% Hispanic/Latino. Most of my students had previously visited the Central West End; a metro stop connects the neighborhood with Washington University’s main campus. But numbers tell only part of a city’s story. Walking allowed students to observe affect. Some said they initially felt uncomfortable walking along Euclid, visibly out of place. 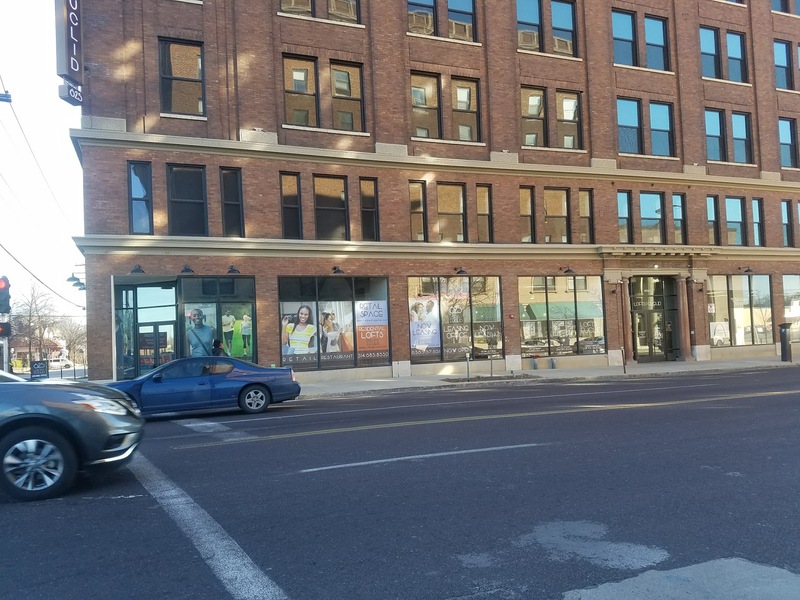 For many, comfort set in for many after we crossed Delmar Ave. At Delmar and Euclid, many-spotted Lofts @ Euclid, a six-story warehouse turned renovated apartment building. 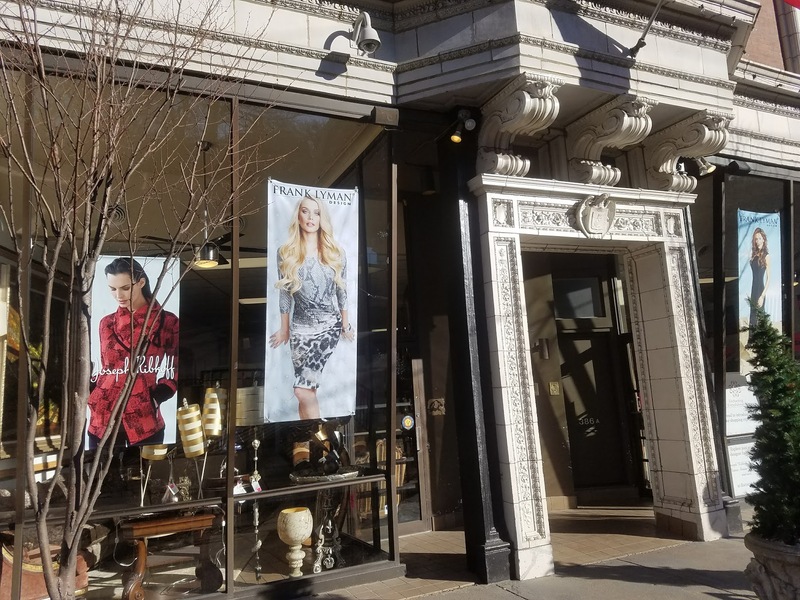 Images of healthy, beautiful black models graced advertising on the building; some commented a pleasant shock seeing black rather than white faces in the advertisement. But for some, crossing Delmar produced a new discomfort. Shiny, exciting Central West End now seemed dulled as students had just experienced a plethora of litter and neglect blocks away. The walk animated what we’d studied: the effects of a century of racist policies in St. Louis that displaced and dispossessed black residents, invested in white neighborhoods, and produced St. Louis as a highly racially segregated city. The walk attuned some of my students to how St. Louis could be more equitable. At basic levels, a lot of students wanted better trash clean up in North St. Louis City. 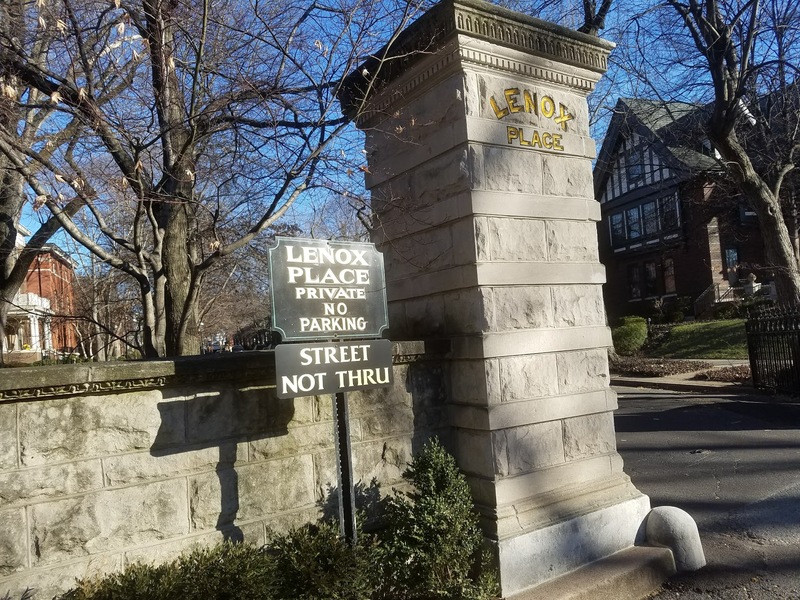 As we walked further south, now in the Central West End a majority white neighborhood familiar to most, we also saw the unofficial trademark of St. Louis: the private street. We saw little to no litter on the sidewalks. 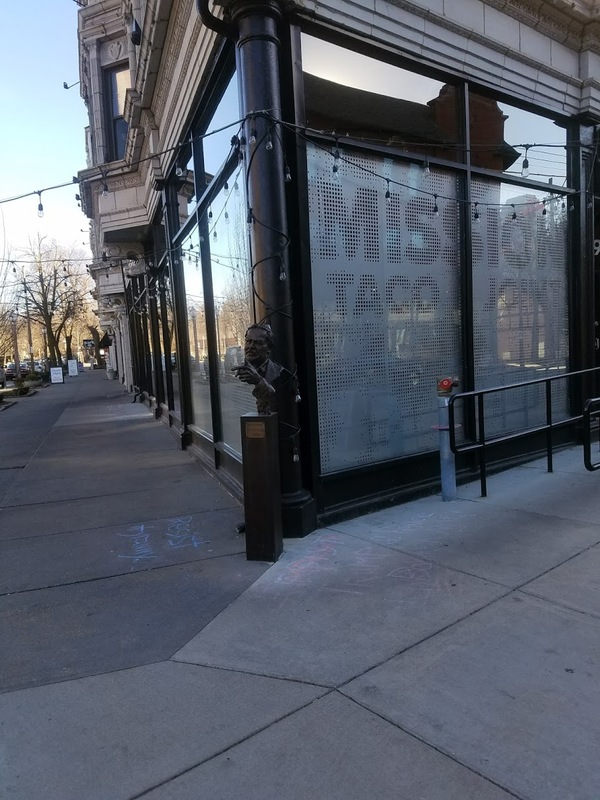 We observed restaurant upon restaurant and shop upon shop including Pi Pizzeria and Mission Taco, two local gourmet St. Louis chains, and Left Bank Books, arguably the city’s best bookstore. When we finally ended our walk at Starbucks, artisanal restaurants surrounded us. St. Louis is often called the divided city. Delmar Ave. slices St. Louis City into two halves, North and South. Many refer to the “Delmar Divide,” that is between North St. Louis City, which is 98% black, and South St. Louis City, which is 70% white. 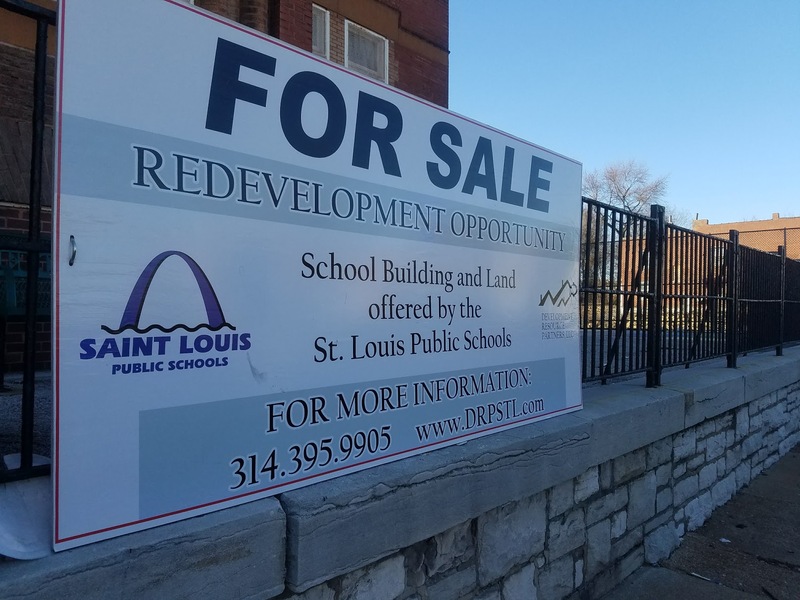 The next week we read J. Rosie Tighe and Joanna P. Ganning’s 2015 article in Urban Geography “The divergent city: unequal and uneven development in St. Louis.” They frame St. Louis not as the divided city but as the divergent city. 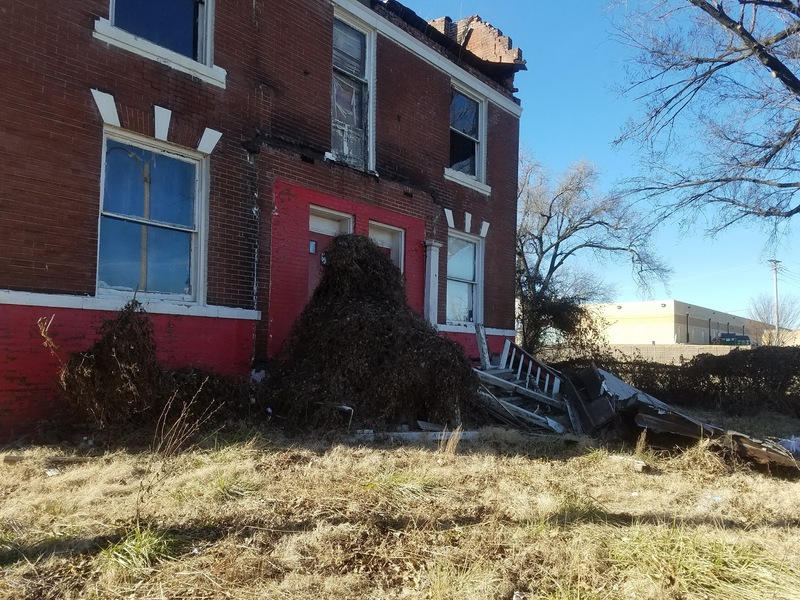 They evidence how displacement and dispossession in majority black North St. Louis City are very much linked to investment and growth in majority white South St. Louis City. The walk animated this: how dispossession in majority black St. Louis is linked to growth in majority white St. Louis, and how policies of dispossession and alternatively investment influence the experience of walking and being in various parts of the city. The idea for this walk developed from two past experiences. 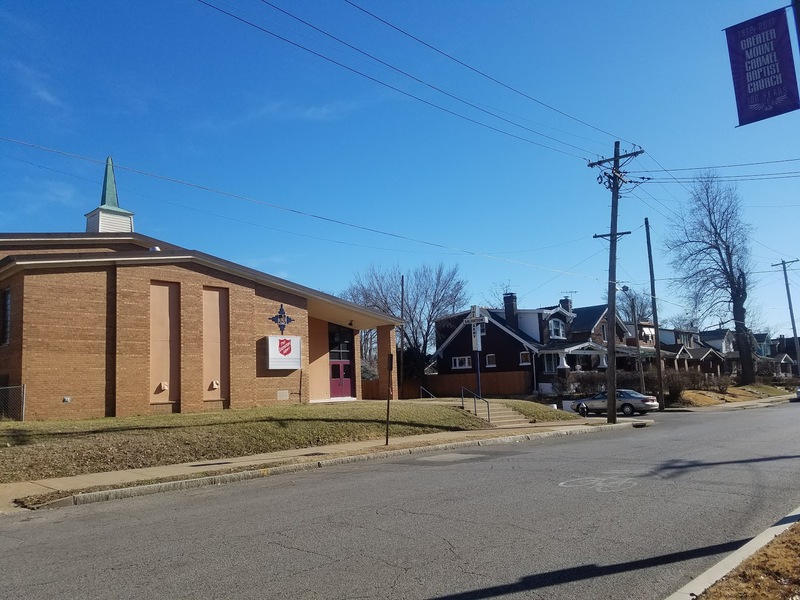 First, in October 2016, I participated in Neighborhoods United for Change, a St. Louis Association of Community Organizations (SLACO) program that pairs residents from a North St. Louis City neighborhood with residents from a South St. Louis City neighborhood. Residents meet each other and tour each other’s neighborhoods as a way to breakdown structures and cultures of segregation and inequity. (I wrote about the experience here). 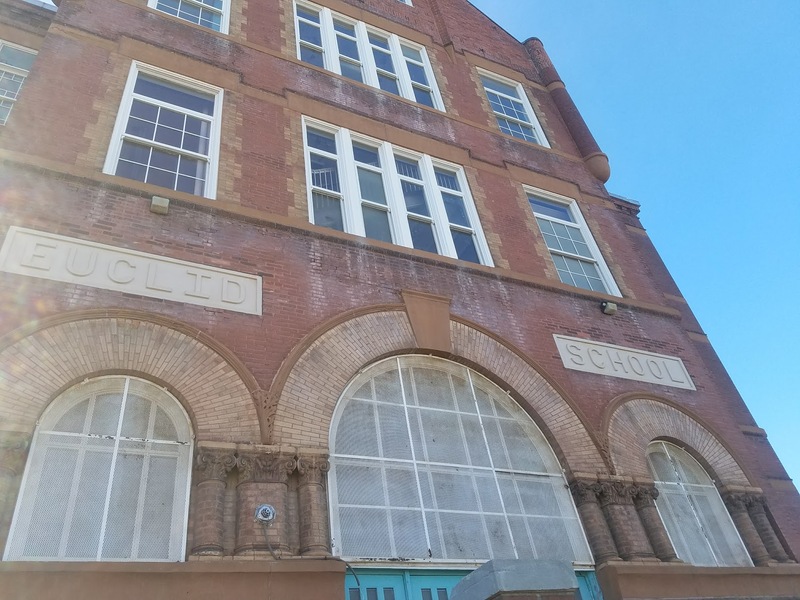 After participating, I knew I wanted to have students engage North and South St. Louis City in dialogue especially as Washington University’s main campus is on the very western edge of St. Louis, and feels palpably different from much of the city. Second, later in October, I participated in Bob Hansman’s tour. 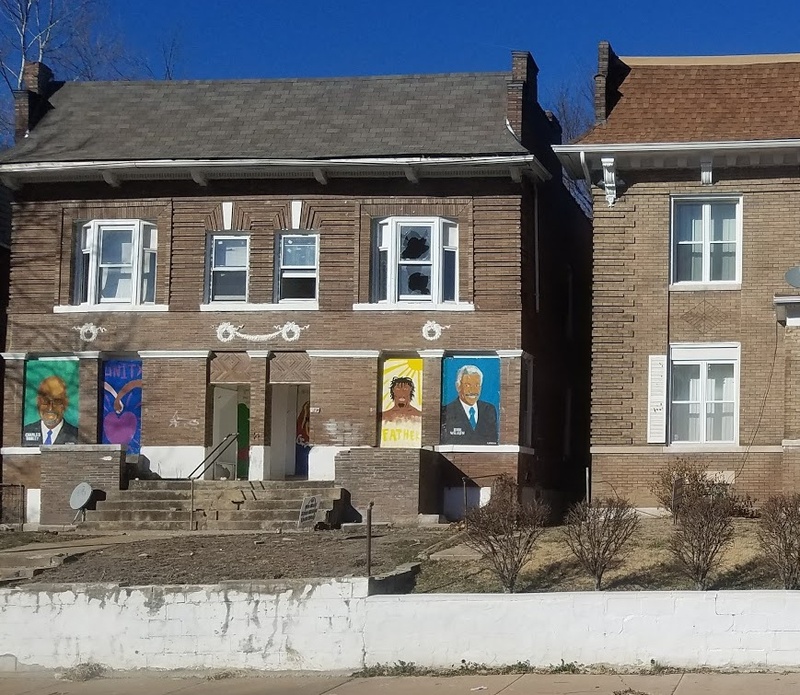 Hansman, an artist and Wash U professor from St. Louis, offers monthly tours centering St. Louis and racial inequities. The tour goes to where Mill Creek Valley, a thriving black and white neighborhood, once stood and was torn down in the 1950s; the forest in St. Louis where the Pruitt Igoe housing project, torn down in the 1970s, once stood; and the Ville neighborhood and Sumner High School, where Arthur Ashe, Chuck Berry, and Tina Turner attended. During the tour, Hansman mentioned how he often has students walk along Euclid Ave to observe how the city changes. 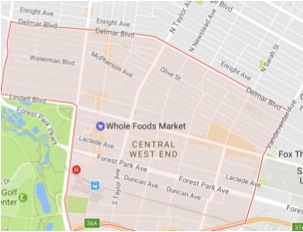 Many undergraduates at Washington University experience the “Wash U bubble,” rarely leaving campus or merely exploring the nearby “Loop” neighborhood, the unofficial hangout for Wash U students full of fast casual restaurants, cafes, and bars. (A new, expensive residential development in the Loop marketed to Wash U students offers a shuttle directly from the apartment to campus). The walk animated lives in St. Louis beyond what many of them know and led them to ask questions about how policy frames the lives of others as well as their own lives. I write this all to offer an imperfect methodological exercise with questions about race, ethics, and impermanence. What does it mean to bring a majority white group—headed by me a black professor—into a majority black neighborhood? What does it mean to bring a majority white group into a majority white neighborhood? How do we respectfully observe and document, and enter and exit another’s space? What does it mean to experience, observe, and document space produced by policies of dispossession and alternatively policies of investment? I’d love to hear thoughts about how others teach about urban ethnography in respect to processes of spatial racism, dispossession, and inequity. What are best practices for walking, observing, and engaging cities? 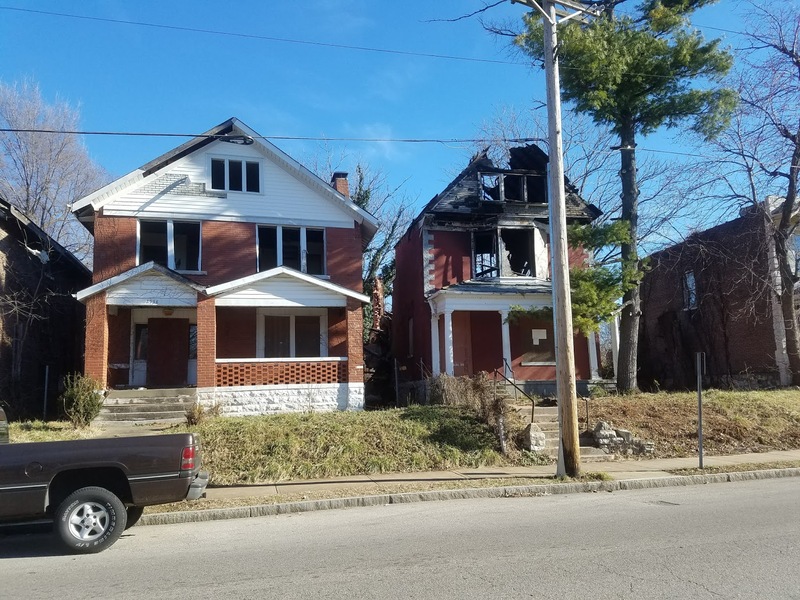 This entry was posted in 21st century, Chicago School of urban sociology, Everyday Life, St. Louis, Teaching Urban Topics, Uncategorized, United States by jasminemahmoud. Bookmark the permalink. Jasmine: Thanks for this inspiring post, and I look forward to incorporating walking (so simple, but powerful) into my own courses on space, place, and urban studies. I would love to see a follow up post at some point that talks more specifically about your methods working with this experience in the classroom: classroom follow up activities; paper assignments; methods of assessments (rubrics). As academics and professors, I feel so often we talk about these very “flashy” activities, but don’t always move the conversation onto the nitty gritty of how to achieve learning outcomes (I know we shudder to use that word). Much of this comment is a reflection of my own struggles with making field trips and the like more fully integrated into the coursework students are asked to do. Thanks so much for your well written and engaging post. Matt, thank you so much for your comment and question. I plan to think more about everyday pedagogy as this course progresses. Here, I wanted to offer some of the readings/exercises we’ve done. On the first day, I had students write their life story on a postcard, an idea from author Michael Kimball via the Imaginative Ethnography blog. This exercise offered a way of thinking about themes of the class: place, narrative, and culture. After the first class, students turned in an initial fieldnotes assignment without much direction from me — they sat in a public space for 30 minutes and wrote about what they observed. I shared excerpts in the following week’s lessons to consider the myriad ways of writing fieldnotes (attention to time, to senses, to dialogue, to space, to people — age, race, gender) and capturing space and culture. Leading to this walking exercise, we read theories on urban space (Setha Low, Michael de Certeau, George Lipsitz) — I had students draw maps of their hometowns on which we discussed theories of place (especially Low’s theories of cities — the divided city, the traditional city, the gendered city, etc.). We read the introduction to and first few excerpts from The Urban Ethnography Reader to think about defining urban and ethnography, and genealogies of urban ethnographies; and Lee Rainwater’s Behind Ghetto Walls about Pruitt Igoe in St. Louis. We also read from Clifford Geertz, and from Writing Ethnographic Fieldnotes to think about how writing is a method of collecting data, analyzing data, and presenting data. Class exercises have trained students in thinking about observation through the senses — I offered on campus “fieldtrips” where groups of students explored a place on campus first through touch, and in a later week a different place through smell. Across these lessons, I strive to center thinking about race, spatial racism, and racialized space (in readings and discussion) to understand logics of development in St. Louis.